Opening doors, hood & trunk ,hood with detailed engine. Highly Detailed inside with seats and steering wheel. Detail interior and exterior with openable doors & hood, free wheels. Rubber tires. Made By : MOTORMAX. 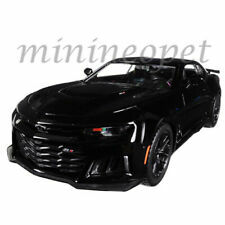 2017 CHEVROLET CAMARO ZL1 1/24. Color : BLACK. We will do our best to reply as soon as possible. G LGB 1:24 Scale 1957 Bel Air Hard Top Chevrolet Chev Model Car made by Motormax. This highly detailed model is strongly made and features opening front doors and bonnet to reveal engine and interior. 1958 Chevy Apache Pick-up with Jack Daniels Custom Graphics. With 2 Authentic Looking Whiskey Barrels. Opening: Doors - Bonnet - Rear Tray. THERE IS NO PICKUP FACILITY AVAILABLE. Colour : Gloss Black. Competitive Pricing and Unrivaled Selection We are the number one direct distributor of diecast model cars in the USA, so we are able to provide very competitive pricing. Has steerable wheels. Model No. 73203. Model By MotorMax. 1992 Chevrolet 454 SS Pickup Truck. Diecast 1:24 Scale. Color: White. Made By : MOTORMAX. 1955 CHEVY BEL AIR HARD TOP 1/24. Opening : HOOD, DOORS, TRUNK. Color : GREEN. We will do our best to reply as soon as possible. Made By : MOTORMAX. 2017 CHEVY SILVERADO 1500 LT Z71 CREW CAB PICK UP TRUCK 1/27. Color : BLACK. We will do our best to reply as soon as possible. 1950 CHEVY BEL AIR - YELLOW, Metal. Model Car. Model Car. 1950 CHEVY BEL AIR - YELLOW. Detailed interior and exterior. txzj pxzj12681 txzj-11 txzj115 txzj117. A tough diecast model ideal for garden railways, play or display. Detail interior and exterior with openable doors & hood, free wheels. Rubber tires. Box size: 9.5"Lx 4.5"Wx 4"H.
Made By : MOTORMAX. 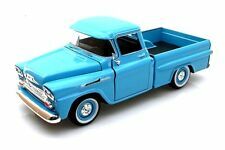 1966 CHEVROLET C10 FLEETSIDE PICKUP TRUCK 1/24. Color : BLACK. We will do our best to reply as soon as possible. DIE CAST CAR 1:24 SCALE. MOTORMAX DIECAST CAR. Contains One of each we will be glad to help you. Made By : MOTORMAX. 1964 CHEVROLET IMPALA 1/24. Color : BLACK. We will do our best to reply as soon as possible. 1948 CHEVY AEROSEDAN FLEETLINE 1/24. Made By : MOTORMAX. Color : RED. We will do our best to reply as soon as possible. Opening : HOOD, DOORS. 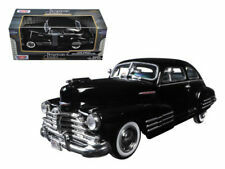 1948 CHEVY AEROSEDAN FLEETLINE 1/24. Made By : MOTORMAX. Opening : HOOD, DOORS. Motormax 2017 Chevrolet Camaro ZL1 1:24. Scale: 1:24. Exterior Color: Green. Open Hood, Doors. Motor Max 1958 Chevy Apache Fleetside Pickup. Scale 1:24. Exterior Color: Red. Used; Loose; No Box. MADE BY : MOTORMAX. Model : 1957 CHEVY BEL AIR HARD TOP 1/24. Opening : HOOD, DOORS, TRUNK. COLOR : RED. We will do our best to reply as soon as possible. 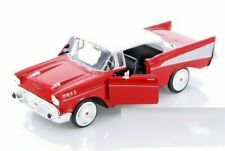 This 1957 Chevy @ Door Hardtop Bel Air is a 1/24 scale diecast model replica. It's a fantastic selection for any classic car collection, and a real gem for unwavering Chevrolet buffs! Model No. 79347. Model By MotorMax. 1970 Chevrolet El Camino SS 396. Diecast 1:24 Scale. Color: Blue. Made By : MOTORMAX. 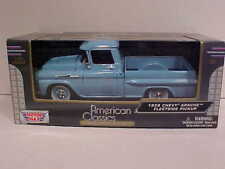 1970 CHEVROLET EL CAMINO SS 396 PICK UP TRUCK 1/24. Color : BLUE. We will do our best to reply as soon as possible. Opening : DOORS. Competitive Pricing and Unrivaled Selection We are the number one direct distributor of diecast model cars in the USA, so we are able to provide very competitive pricing. Opening hood, trunk and doors. Opening doors. Electrostatic paint coating. The doors open to reveal an impressive level of detail on the interior and engine. Average size 1/24 car: 18 cm. 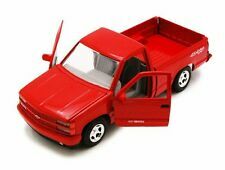 G LGB 1:24 Scale 1966 C-10 Fleetside Truck Pickup Red Truck Diecast Model. A tough diecast model ideal for garden railways. Size 200 x 80 x 80. A delightful model with opening doors that reveal a detailed interior! 1950 Chevrolet Bel Air Hardtop Mint Green with White Top Diecast 1:24 Scale. 1:24 Scale. Condition: Model is in very good condition. Box does show signs of wear from storage. Manufacturer: Motormax. The details of this diecast replica are incredible! 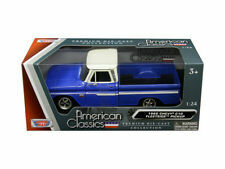 Features detailed interior and realistic dashboard, real rubber tires, detailed opening doors. Therefore owning it is like owning the real car. 2017 CHEVROLET CAMARO ZL1 CALIFORNIA HIGHWAY PATROL CHP POLICE CAR 1/24. Made By : MOTORMAX. We will do our best to reply as soon as possible. Manufacturer - Motormax. 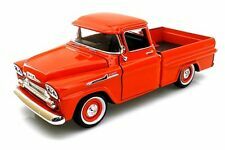 Model - 1958 Chevy Apache Fleetside Pickup in Orange. Scale - 1:24 (approx 19cm). G LGB 1:24 Scale Chevrolet Aerosedan Fleetline 1948 Motormax Model Car 73266. Size 208 x 80 x 70mm. 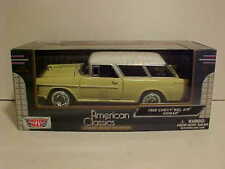 This beautiful diecast model is strongly made and includes. 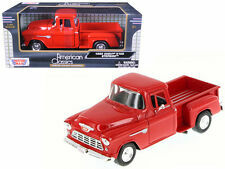 1958 Chevrolet Apache Fleetside Pickup Diecast Model 79311. Made By Motormax. Color Yellow. HardTop Black. What you see in the photos is what you will receive.